Okay, so I tried blogging from Indianapolis to no avail. It just wasn’t in the cards. Plenty of other people did, so you could have gotten your fix anywhere, therefore I don’t feel too bad about it. I’m going to go through the weekend, and then give you tips for your first time going to Gencon next year, because if you haven’t gone, YOU NEED TO. We arrived at around 2:30pm, and made a mad dash to the hotel for check in, and off to the convention center. We were staying at the Marriot Courtyard, about a 15 minute car ride from downtown. The Indy airport is nice, and the car rentals are conviniently adjacent to the terminal. No need to grab a shuttle. In and out. NEWBIE DM TIP: Don’t be cheap. Stay downtown and avoid having to drive there and find parking. There are hotels linked by walkway to the convention center. The Marriot, Omni, and Westin hotels are all there and within their walls tons of games and seminars are hosted. This is the way to go. Not a hotel away from downtown. At 4:30 I made my way to one of the RPG Bloggers Network seminars held over the weekend. This was a lot of fun, and was a great way to assign a face to the bloggers that are part of the network. At 7:00pm, I was off to my first game. I got in on a Star Wars d6 game, hosted at the Westin, and one of the players was none other than Monte Cook, hero of D&D 3.0 fans everywhere. Super nice guy. I love that game, so I had a great time. I took the time to ask Monte about his opinions on digital gaming. A few weeks ago, I wrote a blog post on the matter, and there were various opinions from the readers, so I wanted his. He mostly agreed with my view, that it’s the future of the game. He also thinks that the only way to eventually keep people into buying the books is to pack in added value items and premiums, much like cd box sets do. I tend to agree with him on that point. Nice leather bound books that are worth owning, etc… Monte was a very nice guy, and gaming with him was a great way to start my weekend. After that game ended, I walked around a bit through the hotels, and then headed back to mine — Very hungry. NEWBIE DM TIP: There is an app for the iphone/ipod, listing every official game, event, and seminar going on. Download it and use it. Schedule yourself and have a loose plan of what you’d like to do on each day. Also make time to eat, or take snacks with you. Friday was the day for the Ultimate Dungeon Delve, and trying out the new Pathfinder game. I’m sad to say that both things turned out to be bad experiences. First we hit the D&D 4th Ed. Ultimate Dungeon Delve, where a DM runs you through 5 timed encounters, each lasting 45 minutes. If the time runs out before you finish, you are done. We got through the first encounter easily, and came in under in time. The second encounter, however, was a different story, but not because of us. We brought the last enemy down, and one more hit would have killed him. Unfortunately for us, the DM made a bad call that hurt the team. One of our PC’s was affected by a whirlwind, which restrained him. The PC used an interrupt power to teleport out of the whirlwind, and free himself from the restraints, so he could keep pressing the attack. The DM judged that he could teleport, but would still be restrained and immobilized, totally killing the point of the teleport. Bad call, but he wouldn’t budge. So that was that. On to the “new” Pathfinder game. Okay, so I have a rocky relationship with 3.5, and I’m not sure why that is. Maybe it was the presentation, or character creation that bothered me. The truth is that I’m not quite sure why I just felt really indifferent towards it in general. 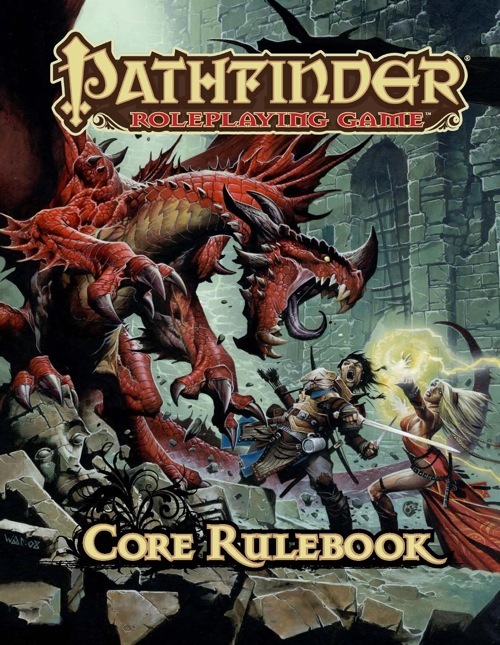 But I was willing to give Pathfinder a try. The book is very nice, a gorgeous product, so why not? Let’s see what made Pathfinder different. Well, I left there disappointed as well. First, the DM was about 14 or 15, and a little rusty. He then told me that Pathfinder isn’t even his favorite system, he’s just doing it for “the money”. Whatever that money may have been (maybe swag). Thirdly, the characters were 1st level pre-gens. 1st level. Now, if you are pitching a product that supposedly has more streamlined rules than its predecessor, highlight them in these games. Show me what the difference is. At first level, I doubt it’s much. And its unfortunate, because I wanted to see what the big deal was. Also, if you are at a Gencon, hyping your big release, put on your best DM’s on these games. Not a 15 year old kid who wasn’t a great salesman to begin with. Bad experience with Pathfinder, but again, great looking book. I doubt Paizo needs much hyping as they sold out anyway, but I failed to see the supposed differences. By the way, I paid $6 to play. It’s not free. I expected a better experience for my cash guys. Sorry. NEWBIE DM TIP: When you go register for your first Gencon next year, buy yourself a couple of generic event tickets as well. They only cost $2 each. If there’s a specific event you want to try but don’t have a ticket for it, the generics will let you in if there’s space. You may need to turn in 2 or 3 tickets though if the event costs more than $2. Saturday was an early day, and we did a little old school gaming with Hackmaster. I was playing a halfling Wizard, and in Hackmaster, halflings are essentially Hobbits, like they were in 1st ed. D&D. I had some trouble with the character creation (as seems to be a running thread in my gaming life) but once we got past that it was okay. I’m not in love with 1st ed. D&D, or games like it, but it was fun enough. I then hit some seminars, like the GM JAM hosted by the guys from a few gaming blogs. We got some solid DM’ing advice both from the panelists and the audience. Good times. That one was hosted by guys from 4e blogs, all members of RPG Bloggers. The panel was good if you are interested in writing a 4th Ed. blog. Like me. I sat in on a game called Alpha and Omega. Very cool. Some of the sleekest and sexier books I saw all weekend. The game is set in earth in the far future, and a war is brewing between Angels and Devils on our turf. Very nice, interesting mechanics, and worth a revisit. My brother bough the books, let’s see when we play it. A shot of the Alpha & Omega monster manual: "The Encountered"
Saturday I also hit a Star Wars Saga game, “Murder aboard the Executor.” I had a great time playing Star Wars. So much so that I’m buying the books soon, and picked up some minis as well. I also played a pickup game with a couple of friends that was DM’ed by Mike, from the excellent 4e blog slyflourish.com Mike also tweets on twitter as @slyflourish and his tweets are great DM tips. It was a blast to play with him, and he ran us through a fun game. NEWBIE DM TIP: Take the time to sample as many games as you can. Even if you don’t play in them, sit in and watch. 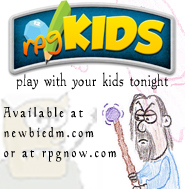 D&D may be your favorite game, but it’s not the only one out there. Explore the rest of the gaming world! Sunday was our last day there, so it was devoted to walking around the huge vendor hall and picking up stuff. I got a free copy of Kingdom of Kalamar Campaign Setting and Atlas for 3.5, just for playing Hackmaster, so I swung by the Kenzer booth to pick those up. I also fed my mini addiction, and picked up both D&D and Star Wars minis. By noon it was off to the airport, and back home to Miami. This was my first convention ever. I went in not knowing what to expect, and unprepared. For next year, I plan to have a loose schedule of events, different game tickets, and a better situated hotel. Overall I had a great, great time. I sampled products, played plenty, met wonderful people that I’ve only interacted with online, and spent a lot of cash. Not bad. If you’ve never gone to Gencon but have always wanted to go but never pulled the trigger on it, do it. Let this be your push. It is worth it, only if to play as many RPG’s as your mind can handle. This post is part of the RPG Bloggers carnival for August: “Conventions, Ren Fairs, and Carnivals, Oh My!” Hosted this month at ChgoWiz’s Old Guy RPG Blog! Good tips, I would add that you shouldn’t overbook yourself. I ran games pretty solid and had a blast, but only saw a small part of the show. It was great to see you and I think running that pick-up game was my favorite experience. There’s not much like looking at your watch, realizing its 1:30am, and you have another game in the same place in six hours. It was wonderful to meet you, my friend. Sorry you had a bad experience with Pathfinder. I’d recommend giving it another shot with a more experienced and committed GM. @Doug: It was a bad 1st impression. I felt the rules updates didn’t come through in the 1st level adventure, and the DM’ing certainly left a bad taste in my mouth. I did pay for the experience, and it sucked. I second the remark about not overbooking yourself. My rule-of-thumb is two/six: sign up for no more than two scheduled games a day, and six in total. This gives plenty of time to wander around the dealers’ room (for which you should dedicate at least a good six hours, if you really want to see everything and play a few demos) and to drop in on a game or two that looked interesting in the program. Not to mention things like meals and sleep, of which you need at least a couple of hours. I had five scheduled games and 10 generic tickets (which all got spent), and my convention schedule was still pretty packed after the dealers’ room, the free seminars, the pickup games, and the side events like the movies. Only two scheduled events a day??? I scheduled about four a day at Origins! Granted, there’s a lot less of the dealer’s room and I didn’t walk in on any games, but I got into all the games I wanted to and had an absolute blast. I guess GenCon is way different than Origins. Origins is another gaming convention and is held in Columbus, OH at the end of June. From what I hear, Origins is where you go if you want to play games, GenCon is where you go if you want to buy the new stuff that everyone is releasing. Plus I hear that restaurants are a little sparse at GenCon. Origins has a full food court, plus several dozen restaurants within walking distance that have fantastic food from all cultures for all price ranges. If anybody wants to go to GenCon, you should take a look into Origins too, since it’s similar (and some might say better). Sure, there’s less of a dealer’s room to look through, but there are a lot more games and fun things like that. I had a bad experience at Pathfinder as well. While the DM was well over 16, he had not read through the adventure, which was a real problem because he kept pausing to read. Long pauses. And he didn’t know the rules very well at all. I complained later to the staff just so they were aware. What was the pickup game that you played on Saturday? I think I saw you (if you were the ones wearing the http://www.newbiedm.com shirts) from a few tables over at Games On Demand in the Omni Severin’s Fisher ballroom. @newbiedm – Agreed. First impressions are important and I am sorry you had a bad one. As for rules updates, it depends on the scenario you played. If it was one of the four Year One scenarios, they had sidebars that called showed how the scenario showcased new rules. All Year Zero (Beta) modules used standard 3.5 rules, so no new rules were featured. Which scenario did you play? @Fly – Were you playing in a pickup game? If so, you may have had someone who was willing to run but had not read the scenario. All of the PFS GMs I met were excited to help expose new players to the game, so some (like me) took on pickup slots when asked. In retrospect, it might have been better to run a scenario I had prepped than the one requested by the table, especially since my table were all new to PFS.